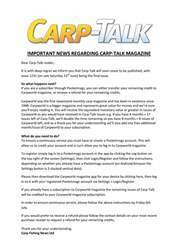 This week’s issue of Carp-Talk (issue 1006) is available to download now! 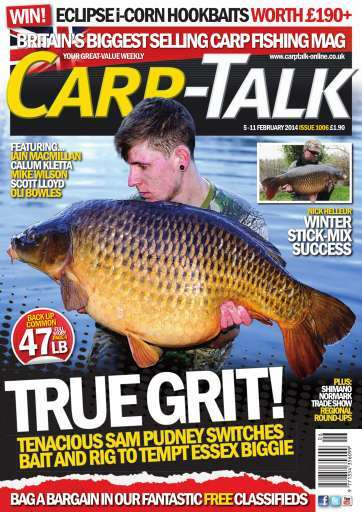 The Braxted Back Up Common is one of a handful of forties in this week’s issue, having been caught by Sam Pudney just 20 nights after he joined the lake. An East Midlands fifty, a 46-pounder from Cleverley Top Lake and lumps from Frimley Pit 3, Farriers and Grenville’s are also amongst the news pages. 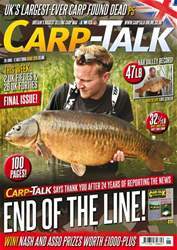 Nick Helleur reveals how productive his stick mixes can be, Iain Macmillan looks back at his last spring on Wellington Country Park Lake, Mike Wilson takes advantage of some warm January weather, Oli Bowles details his single-bite tactics, and Calum Kletta returns to Abbey Lakes in France. 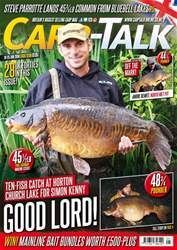 We have also got a great Eclipse Baits giveaway, in which a selection of hookbaits will be up for grabs.